on February 27, 2011 at 3:04 am Kim T.
Looks like a good plan. I wonder if earth bags can be used to construct a walk out basement style first floor. Yes, that’s what you would have with this plan if you add earth berming. One option is to add buttresses to retain the earth. How difficult would it be for a beginner to build a deck like that? That’s a basic carpenters project. You could get a library book on carpentry and study each step — how to set posts, beams, attach joists, building railings, etc. The most difficult part is stair building, but again, take time to study what’s required and you’ll be successful. This assumes a basic knowledge of tools, measuring, cutting, etc. So this is definitely within the reach of someone who has a few weeks worth of general carpentry experience. That’s how most carpenters start out — they build decks, car ports, sheds, etc. working under a skilled carpenter. Once you learn the basics, you can build almost anything with enough time and effort. What would you need to make this round house with yurt? If we had a yurt, than we could build the round house as the support. My question is what would we need to separate the 2, a standard floor system? Also would a 30ft round house foundation be able to support a 30 foot yurt with 10 foot walls and a loft? Thanks for your time! Yes, just build a standard floor system. It’s best to build a bond beam on top of the earthbag walls and then set the floor joists on that. Earthbag walls are about 10x stronger in compression than wood framed walls, so there’s no problem carrying loads of upper floors. Please take photos so we can share your project with others. on July 30, 2012 at 3:01 pm "MagicDave"
What if earthbags were made from tightly woven burlap instead of polyethylene? Related idea that popped in my mind just now: You could create a niche business selling organic burlap bags. Earthbag building is growing rapidly (thousands of houses already built all over the world). This would be a win-win-win scenario, where producers save money on not having to treat the bags, consumers get a natural product, and you make a little money for the effort. Just be aware that burlap is not as durable as polypropylene. The bags will rot and so you want to finish the walls fairly quickly or coat them with lime, paint, cement, etc. as you go. Once the walls are sealed with plaster then the tamped earth should last a very long time, assuming adequately wide roof overhangs, etc. Note: most burlap bags are made in India. In regards to building a standard floor system to house the yurt that will go on top, would a center pole or support be necessary? I am one of those who intend on building an earthbag roundhouse, but lack sufficient carpentry skills to build a roof with confidence on my first go-round. I cannot seem to find good info on joist size, spacing, etc. for my area– semi arid North Texas. Basically everything says to call a contractor – which I think is one of the major sustainability issues we face – the (fabled) need for the “expert class.” For a flat roof on this 20′ or even the hobbit house (almost 25′) – would 2×8 ‘s or something like your pallet trusses work straight across that kind of span? I always liked the idea of having a yurt that breaks down easily as a means of shelter when visiting family, etc. – Which would be great to have as the top of the roundhouse as well. Beats having an RV in my opinion. Best of all, you could live in it while building the roundhouse and throw it on top when done. Ever since I found out about this site, Ive wanted a roundhouse with a roof where we could sit and watch meteor showers. No need for ‘experts’ when it comes to simple structures like this. Look up lumber span tables on the Internet. They show how far you can span for various sizes and kinds of wood. 20′ is a fairly long span and that’s why a post and beam are recommended. It wouldn’t be efficient to use massive floor joists. Pallet trusses are slow and rather awkward to build, although they would work. Adding one post and one beam (even a two-part beam with a joint above the post) would be far easier than building pallet trusses. This effectively cuts the span in half — from 20′ to 10′ at the longest point. Now you can use much smaller floor joists. Floor joists can be overlapped above the beam so you don’t need to use full length boards. You’re doing some cool stuff. Shoot me an email if you have more questions. 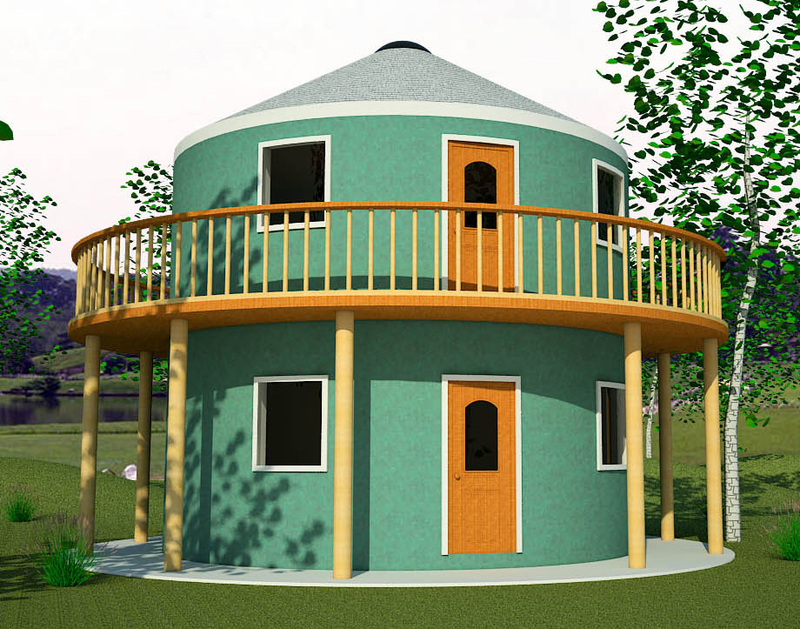 I believe I would like to order the Roundhouse with Yurt plan but I didn’t find it on the site Dream Green Homes. Where can I find an interior drawing of this plan and potentially order this plan? Thanks.